Some have wondered what exactly these famous behavior-shaping urinals look like. By popular demand, here they are. Two of them. A wide shot and a close-up. By coincidence, Nudge reader Anthony Garone sent along another nudge idea for bathroom urinals. (If he was inspirited by the New Republic piece, he didn’t mention it.) He suggests a bath mat that makes annoying sounds whenever a guy misses and his “spillage” hits the floor. For some reason, the men at my work place have a hard time not leaving puddles in front of the urinals. When I go to the bathroom, it disgusts me to stand there with my shoes next to these miniature germ-lakes. So, my nudge idea is to create a floormat that sits under the urinal and makes a loud and/or obnoxious noise when a guy misses the target. Preferably, this noise would be audible from outside the men’s room to maximize potential embarrassment. Why stop there? Lets combine the “choice architecture” of the amsterdam urinals, Anthony’s “averse sound mat” concept, an aspect of the Milgram experiments & Lovaass infamous work- and have the mats deliever a mild electric shock to all men who splatter beyond the acceptable amounts! Of course, we will then have to account for the sociopathic personality – latent archtype (SPLAT)-who will surreptiously splatter on the person’s mat who is standing next to them. Far be it from me to splatter your blog anonymously! Sorry left my e mail off prior note. We have been using this “technology” in English primary schools for many years – they have urinals with a real target painted on it. In Germany (and neighboring continental European countries) it has become part of middle-class etiquette for men to do their business while sitting down on the toilet in order to reduce the mess. A few years ago, I was invited to a party, and, after consuming some beverages, went to the toilet. When I lifted up the toilet seat to do my business standing up, I triggered some kind of audio recording: a voice spoke to me and reminded me to sit down! Much to my embarrassment, I think it was audible outside, so other guests must have noticed that a man just attempted to break the toilet etiquette…! That could explain quite a bit about Continental foreign policy. Jess, I hope you took no notice and struck a blow for mankind. I am often disgusted with females who hover rather than sit. The next person who has business to attend to must check for splatters on the seat, or risk sitting in a puddle. Eeew. Why not just post a sign: “Please be considerate of the next passengers and keep this area clean.” Wouldn’t this be just as effective? Sometimes people need to be reminded to be courteous, especially if they’re in a hurry or preoccupied. The problem with the ‘fly’ solution is that once people get used to it, they forget about it and return to their normal behavior. Or worse, they feel manipulated and behave even worse in retaliation. But if you educate people you can change behavior permanently. 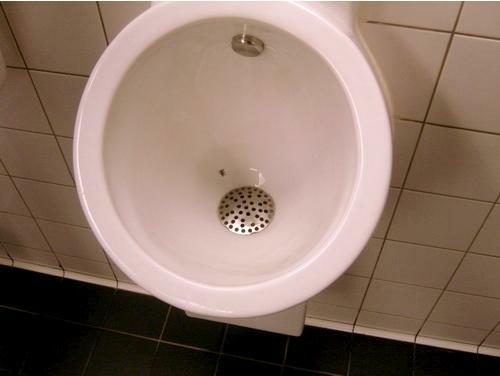 ‘Nudging’ is no substitute for education, whether it’s in peeing or how to spend money. Give people the information they need and let them make their own rational decision. They will.